& when I say “Traveller”, I generally mean “classic Traveller”. Sometimes abbreviated “cT”. Aptitudes: What characteristic scores give DMs for each career? Far Future: Marc W. Miller’s company. (MWM is the creator of Traveller.) Sells Traveller5, the latest edition, and cT reprints as well as reprints of other GDW products. BeRKA has a map of the Spinward Marches as well as individual subsector maps & world data on his Zhodani Base site. Citizens of the Imperium forums: Forums for discussing Traveller in all its incarnations. Hosted by QLI/RPGRealms. GURPS Traveller: Steve Jackson Games publishes a GURPS version of Traveller. (Sometimes abbreviated “GT”.) Some of the supplements can be used with CT. 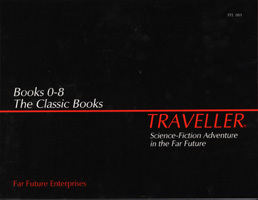 The Traveller game in all forms is owned by Far Future Enterprises. Copyright 1977-2004 Far Future Enterprises.